Try our HELP ME CHOOSE option from the top menu. Each product has a recommended "View Distance" in the SPECIFICATION tab on each product page (next to Description). How much do these mirrors cost? Prices are listed for each model and each size on our website (including GST and Freight). Do I need to have an account with you to purchase a mirror? No, you do not need to have an account with us. You can make a one off purchase using the GUEST CHECKOUT. You can make payment on our website with your credit card (Visa or Mastercard) or choose Bank Transfer to pay on an Invoice. See our HOW TO ORDER ONLINE page for more steps on orders and payment. Do you have representatives who can come to our property and advise which mirror to purchase? No, we are an online retail store only. 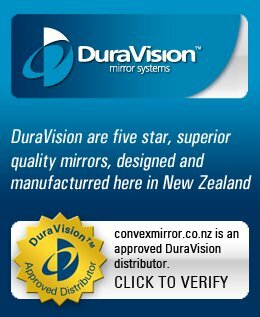 If you email us with your location, we may be able to put you in touch with a local DuraVision distributor who can help. No, we are an online retail store only, however our mirrors are very easy to install. Check the Installation guide for each product in the SPECIFICATION tab on each product page (next to Description). Do the mirrors come with mounting brackets? Yes, most of our adjustable mirrors include brackets. Check the diagram on each product page to see how the mirror is mounted. All items on our website include shipping to anywhere in New Zealand. If I purchase a mirror and it isn't the right size, can I return it for a different size? Yes, on the condition the mirror is returned in the correct packaging and in a re-sale condition. Please email us if you need to return an item. See our SHIPPING AND RETURNS page. No, we are an online retail store only. (Please contact Bennett Mirror Technologies for trade enquiries). Do you have a shop where I can come and look at these mirrors? No, we do not have a physical street address with a shop. Can I install the mirror on a Power Pole? Yes, however you may need permission from your local council to do this. Our wall mounting brackets can be attached to a large power pole with steel strapping (available from a traffic sign or road equipment company). Do you sell brackets or replacement parts? No, we only sell complete mirrors and accessories listed on our website. Do you sell flat mirror sheet?